Introducing PW2Link, a new application designed to make handling mods and addons easier! With PW2Link, you have access to a wide range of mods, both singleplayer and multiplayer. You can download as many as you want, and with fast download speeds and 7-zip compressed files, you won't be waiting long. PW2Link automatically updates your mods to the latest versions should a new version be released. It will also automatically update itself with no hassle. You can choose when to install the updates. PW2Link integrates with Steamless CS Project and PlanetWON2, providing you with the latest Half-Life news, as well as the latest patches and mod releases. Want to play on the WON2 network? 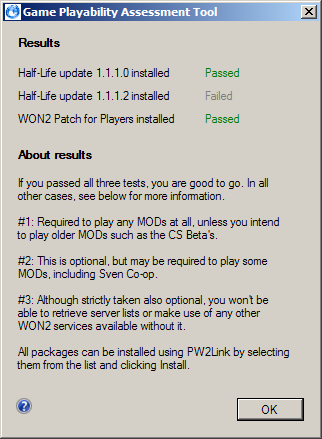 PW2Link has a game playability assessment tool, which will help you prepare your Half-Life client for WON2. It checks whether key patches and updates have been installed, and helps you find them if they aren't already installed. PW2Link is currently in development. The first public beta release is expected to be arriving soon!